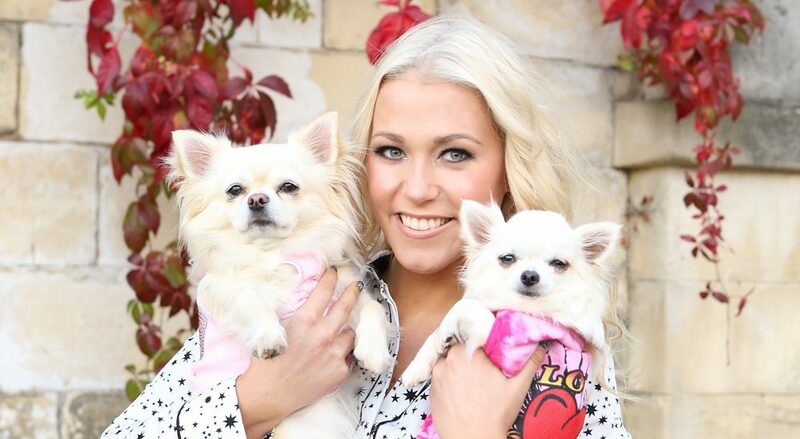 Amelia Lily shot to fame when she came third on ITV’s hit show, ‘X Factor’ at only 16 years old. After finishing third on the show she went on to release 'You Bring Me Joy' and toured with Girls Aloud and Olly Murs before being cast in the UK tour of ‘Joseph and the Amazing Technicolor Dreamcoat’. Most recently, Amelia let us see the real her when she took part in the reality TV show, ‘Celebrity Big Brother’ and finished second. Anyone who watched the series, which ended up being quite drama filled, will have seen how Amelia kept her cool and tried to stay out of the drama. Instead, she spoke about the three big loves of her life – her dogs, Elphie, Belle and Fifi. K9 Magazine’s Kim O’Meara caught up with Amelia to learn more about them and find out where her love of dogs comes from. Hi Amelia! Thanks so much for taking the time to chat with us today. We know you have three dogs, please tell us all about them. Hi! Well, Elphie is my oldest and I actually got her when I was on the radio tour for my first single, ‘You Bring Me Joy’. I’ve always loved dogs and really wanted a little dog for company because it’s quite lonely being an artist and travelling on your own all of the time. So, I was on tour and near Milton Keynes and saw Elphie, who was 14 weeks old at the time, on this app and she was literally in Milton Keynes, so I drove to the address and just fell in love with her so I took her there and then. That was about 5 years ago now. Oh wow, sounds like fate! I’m guessing she stayed on tour with you? (Laughs) She did and she stayed in some top hotels. So Elphie must be around 5 now then. How old were you at the time because after ‘X Factor’ life must have been a bit of a whirlwind? It’s sometimes easy to forget that you were only 16 when you were on the show. You must have been more mature than most 17 year olds? (Laughs) Yeah, I kind of had to be really. And so next came Belle. How did you come to own her? She did. I got her two years ago. I really wanted to get another dog and I’d often fancied getting another Chihuahua because I’d often heard that as a breed they work better in packs, but I was waiting for the right time. So when I had a couple of quiet months I decided to take my time, do my research and I found a breeder called ‘Chelsea Chihuahuas’. I rang the lady and she pointed me to her Instagram and I saw little Belle who was eight weeks old at the time. I was obsessed with her and got in touch and she told me she’d literally just sold her. I was devastated and pleaded with her to try and convince the couple to let her join our family. But it didn’t seem like that was an option and I was devastated because I’d really fallen for baby Belle. She told me she had another litter coming in a couple of months and I said ‘okay’ trying to convince myself that it wasn’t the end of the world, but I was really devastated. Then two hours later she called me back and said that the other couple had decided to wait because they actually wanted a chocolate Chihuahua anyway and it meant that Belle was mine. She said the passion in my voice was what she wanted to hear from customers and I mean, you can imagine can’t you, I was over the moon. So that’s how I got baby Belle. So you fought for her. I did. I fought for her (laughs). How did Elphie react when you brought her home? Elphie was really excited. I mean, as much as Belle was teeny weeny when I brought her home, literally she was a little ball of fluff, she really used to give Elphie a hard time play fighting, but Elphie was so good. She’ such a beautiful, kind girl and I think she knew that Belle was just a baby. She’s so protective of me, Belle and now Fifi. Fifi’s your latest pup isn’t she. Tell us all about her. Fifi-licious! Back in March, I’d just come out of a long-term relationship and I decided I wanted a new dog. I wanted my next dog to be different to Elphie and Belle, who are both long-haired, so I decided I wanted a chocolate short-haired Chihuahua and called Maria, who was Belle’s breeder and asked if she had any litters. She said she actually had two chocolate short-haired babies, one had green eyes and the other had blue eyes. Fifi was the puppy with green eyes and as soon as I saw her photos I just thought she looked so different with the tan above and below her eyes and on her paws. She was about 12 weeks at the time so a little bit older than Belle was when I first got her and I went with my dad to see her. When we got there, oh my god, wasn’t I shocked. I couldn’t believe it. She was smaller than Belle, which I hadn’t been expecting. She looked like a little hot dog. Literally, a little hot dog. Both my dad and I fell in love with her there and then, and that’s how I came to own her. Her green eyes really do stand out, don't they? She's beautiful. Did you have any custody issues around Elphie and Belle when you split up with your boyfriend or have they always been your dogs and only yours? We heard you mention your dogs on ‘Celebrity Big Brother’ saying you’d like five. Have you always loved animals? I have. I used to own guinea pigs. I’m sure I’m going to be a crazy dog lady with loads of dogs one day because I just love them. You were in ‘Celebrity Big Brother’ right until the end when you finished as runner-up – congratulations! Thank you. I honestly never even thought I’d make it as far as I did. I thought I’d be out in the first round of nominations. Literally, I was just completely shocked. Was that the longest you’ve spent apart from your girls? (Thinks about it) Actually, I think it was. Looking back on the experience now, what were your rose (good) and thorn (bad) moments from the show? Well, the tasks were a highlight for me. I loved the cheerleading and taco tasks because I got to dress up. Meeting everyone in there was another highlight because I met people from all different types of industries, like Derek, he’s had an incredible life and is just an incredible person to talk to. The drama was probably a low point. I try to avoid drama and confrontation, to be honest, but I will always stand up for myself when I need to. I won’t let people walk over me. Do you think being on ‘X Factor’ at 16 gave you a different perspective about CBB having done so much already in your career? Definitely. Getting into the limelight at 16 just after I’d left school meant that I had to grow up fairly quickly I’ll happily admit that. But it’s what I always wanted to do. I always wanted to be a singer and an actress, so with ‘X Factor’ I got this huge platform and I haven’t stopped working since then. You do have to be fairly thick skinned and keep good people around you. My family have always kept me grounded and I’m proud of where I come from. Did the ‘X Factor’ house prepare you at all for the CBB house? Well, we all lived in a house for ‘X Factor’ but you don’t spend a lot of time there, you’re rehearsing or at events. The CBB house was a completely different experience. Where does your love of Chihuahuas come from? I just remember growing up and wanting to own a Chihuahua. I've always loved ‘Legally Blonde’ so I think that’s where my love of the breed started. But when you decide to get a dog it’s a big commitment so I did my research. I looked at Pomeranians and French Bulldogs but I had a couple of friends who owned Chihuahuas and I just fell in love with them. I felt like I had a special bond with them and I just think they’ve got such big personalities for small dogs. I couldn’t imagine having another breed. When you’re touring do they still come on the road with you? Nowadays they tend to stay with my mum and dad a lot, especially when I’m travelling loads but they have travelled with me a lot. They’re brilliant in the car if I’m driving from Middlesbrough to Surrey. They absolutely love it. They have these cushioned pet carriers and get so excited to run into them, I think they feel safe in them and normally they’ll just go to sleep. They sound like the perfect travelling companions! Our next set of questions are ones you probably haven’t been asked before, are you ready? If you were to swap roles with one of your dogs for a day, firstly, who would you choose to swap roles with and how do you think she'd cope being you and what would you love most about being her? Well, firstly I’d like to be Elphie for the day. She’s so classy, regal and very obedient. She’s also got the most laid back personality and she has such a close bond with my dad that I think it would be funny to follow him around all day barking at him. And I think she’d like to be to me, to be honest. She’s grown up with me. She’s seen what I’ve seen in the industry, so it would be her chance to stand in my shoes and see more of what it’s all about. Pink – I think she would be a French Bulldog – they're really pretty but quite feisty with a cool vibe. Shania Twain – Oh, that is interesting! I think Shania would be a really pretty dog like an Afghan Hound. Such a classy and stunning breed of dog. I’m a huge fan of hers. Mariah Carey – I’m going to go for a Poodle. I think they’re quite glamorous and high maintenance, and if you believe what you read it sounds like she might be too. She loves a lot of bling, doesn’t she? She’s very glamorous. Sarah Harding – That’s a really interesting one. I think Sarah would be a Pomeranian. I think Pomeranians like to bark a lot and Sarah’s very entertaining, she likes to talk a lot and always has lots of stories. They both have big personalities. And what about you, if you were a breed of dog what do you think you’d be? I think I’d be a Chihuahua. I have such a bond with them, not just my own but others too. They’re small but with a big personality. I’m only 5 ft 5, so I’m, you know, I’m fairly small but I have quite a big personality. I feel like they’re really caring and loving dogs and I always try to put others before myself. Describe the last time you laughed out loud because of something you saw one of your dogs or another dog do. A while ago I was in a park having a picnic and there was a Jack Russell cross Chihuahua at the park too, and I started making my high-pitched dog voice and this dog literally pelted across the field and just jumped on me and started licking me. Everyone has a dog voice, don’t they? Well, I used to have 28 guinea pigs all at once. I would like to have played a leading lady in a big West End show. I’d like to be presenting on TV too. I could see you as Elle Woods in ‘Legally Blonde’. That would be amazing wouldn’t it (laughs). What do you think is the most important life lesson that we can learn from dogs? I feel like dogs lead such funny lives. They have no worries. They sleep, eat and get cuddles and I feel as humans we should try to do the same. Try to worry less and keep good people around us. I think dogs are such good companions. Even when you feel low in yourself, your dogs are there for you. They know when you’re sad and they give the best cuddles. Finish the following sentence, my dogs are…adorable, entertaining and loving. And finally, this is always a tough question and often requires a fair degree of thinking time but...if your dogs had the ability to speak and answer one question and one question only, what would you ask them? I’d want to ask them if they know I’m their mummy because when I don’t see them for a while I always go home and say, ‘mummy’s home, mummy’s home’ and I always wonder to myself if they know that I’m their mum.